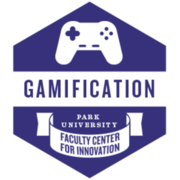 Research shows positive learning gains with the integration of gamification. Therefore, it's important for today's innovative instructors to learn new strategies and techniques with ever evolving technology that exists within this domain. Recipient participated synchronously or asynchronously in a Faculty Center for Innovation-sponsored event on the topic of serious gaming or gamification and has produced a written reflection on how the knowledge gained has affected his/her teaching, scholarship, or service. Have you earned this credit? Be the first to claim this Credit! Must be a file not larger than 20MB.